What's a Good SAT Score for College Admissions in 2019? What is a good SAT score on the SAT exam? For the 2018-19 admissions year, the exam consists of two required sections: Evidence-Based Reading and Writing, and Mathematics. There is also an optional essay section. The scores from each required section can range from 200 to 800, so the best possible total score without the essay is 1600. 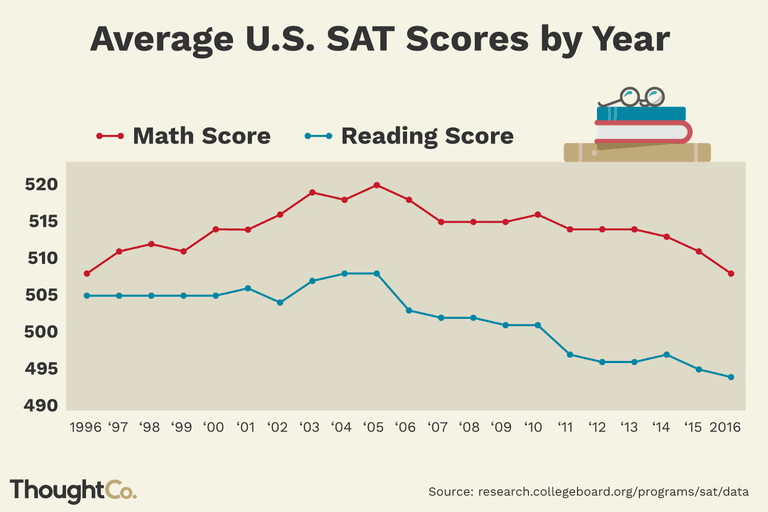 There are different ways to calculate what an "average" score is for the SAT. For the Evidence-Based Reading section, the College Board predicts that if all high school students took the exam, the average score would be a little over 500. For college-bound students who typically take the SAT, that average goes up to about 540. This latter number is probably the more meaningful one since it is the average among the students you are competing with on the college admissions front. For the Math section of the exam, the average score for all high school students is very similar to the Evidence-Based Reading and Writing section—a little over 500. For college-bound students who are likely to take the SAT, the average Math score is a little over 530. Here again that latter number is probably the more meaningful one since you would want to compare your score to other college-bound students. Note that the exam changed significantly in March of 2016, and the average scores are a little higher today than they had been before 2016. What's Considered a Good SAT Score? Averages, however, don't really tell you what kind of score you're going to need for selective colleges and universities. After all, every student who gets into a school like Stanford or Amherst is going to be well above average. The table below can give you a sense of the typical score ranges for students who were admitted to different types of selective colleges and universities. Keep in mind that the graph shows the middle 50% of matriculated students. 25% of students got below the lower number, and 25% scored higher than the upper number. You're obviously in a stronger position if your scores are in the upper ranges in the tables below. Students in the lower 25% of the score range are going to need other strengths to make their applications stand out. Also keep in mind that being in the top 25% does not guarantee admission. Highly selective colleges and universities reject students with near perfect SAT scores when other parts of the application fail to impress the admissions folks. In general, a combined SAT score of roughly 1400 will make you competitive at nearly any college or university in the country. The definition of a "good" score, however, is entirely dependent upon what schools you're applying to. There are hundreds of test-optional colleges where SAT scores don't matter, and hundreds of other schools where average scores (roughly 1000 Reading + Math) will be perfectly adequate for receiving an acceptance letter. The table below will give you a sense of the types of scores you'll need for a wide range of public and private colleges and universities. SAT scores aren't the most important part of a college application (your academic record is), but aside from colleges that are test-optional, they can play a big role in a school's admissions decision. Mediocre scores aren't going to cut it at the country's most selective colleges and universities, and some public universities have concrete cut-off numbers. If you score below the required minimum, you won't be admitted. If you aren't happy with your performance on the SAT, keep in mind that all colleges are happy to accept either ACT or SAT scores regardless of where in the country you live. If the ACT is your better exam, you can almost always use that exam. This ACT version of this article can help guide you. You'll find that most schools report critical reading and math scores, but not the writing scores. This is because the writing part of the exam never fully caught on when it was introduced in 2005, and many schools still do not use it in their admissions decisions. And when the redesigned SAT rolled out in 2016, the writing section became an optional part of the exam. There are some colleges that require the writing section, but the number of schools with that requirement has been rapidly declining in recent years. The table above is just a sampling of admissions data. If you look at the SAT data for all of the Ivy League schools, you'll see that all require scores that are well above average. The SAT data for other top private universities, top liberal arts colleges, and top public universities is similar. In general, you're going to want math and reading scores that are at least in the high 600s to be competitive. You'll notice that the bar for top public universities tends to be a little lower than for private universities. It's generally easier to get into UNC Chapel Hill or UCLA than it is to get into Stanford or Harvard. That said, realize that the public university data can be a little misleading. The admissions bar for in-state and out-of-state applicants can be quite different. Many states require that the majority of admitted students come from in-state, and in some cases this means that admissions standards are significantly higher for out-of-state applicants. A combined score of 1200 might suffice for in-state students, but out-of-state applicants might need a 1400. Many of the country's top colleges require applicants to take at least a couple SAT Subject Tests. Average scores on the subject tests are significantly higher than on the general exam, for the subject tests are taken primarily by strong students who are applying to top colleges. For most schools that require subject tests, you're going to be most competitive if those scores are up in the 700 range. You can learn more by reading about score information for different subjects: Biology | Chemistry | Literature | Math | Physics. What If Your SAT Scores Are Low? The SAT can create a lot of anxiety for students whose scores aren't in line with their college aspirations. Realize, however, that there are plenty of ways to compensate for low SAT scores. There are many excellent colleges for students with not-so-great scores as well as hundreds of test-optional colleges. You can also work to improve your scores with approaches that range from buying an SAT prep book to enrolling in a Kaplan SAT prep course. Whether you work hard to raise your SAT score, or you look for colleges that don't require high scores, you'll find that you have plenty of college options whatever your SAT scores are.